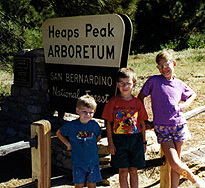 The San Bernardino National Forest is located almost in our back yard, which made it a nice place to go camping this year (1998). I had so many other commitments this past summer that it wasn't possible to go anywhere else for an extensively long trip so we decided to do something local as opposed to not camping at all. 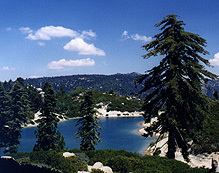 Dogwood campground is located in the San Bernardino mountains right behind Rim of the World High School. It's on National Forest land and a very nice campground. After getting to the campground on Saturday, we hung around the campsite, went to the campfire that evening and just enjoyed being out in the "wild." The National Forest has several nice areas to hike of which we took advantage. The next morning, we decided to try the Heaps Peak Arboretum trail. This hike took us into an area that was burned in a fire and had been replanted with many different plants, some of which are not native to the Southern California area but nonetheless survive very well in this environment. The trail through the arboretum is an interpretive trail and gave many insights into the plants that were living there. We saw Coulter Pines with their huge weighty cones and Sugar Pines with their long slender cones. There is also a grove of Giant Sequoias there that were planted about 70 years ago and survived a major forest fire that blazed through the area about 40 years ago. 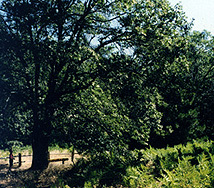 Part of the trail is very open and sunny and you can see Black Oaks growing there like the one in the picture. Also in the picture is a field of ferns which are harvested in other areas as a delicacy. Because the Arboretum was very close to our campsite, we went back to camp for lunch and then headed out again, this time to the Children's Forest. The Children's Forest is an area which was heavily burned in a forest fire in the 70's. An interpretive trail winds through the area with signs created by children which explains what happened and how the area is slowly recovering. What was unexpected was the small lake which appeared on the other side of a rise as we walked on the trail. Sitting down in a small vale, it was a beautiful sight and well worth the walk. We had a snack, overlooking the lake, in a small grove of trees which had survived the fire. Back in camp we enjoyed an evening of quiet and solitude. Our campground had been loaded with boy scouts on Saturday night, but most people had left late Sunday afternoon and when we got back from the Children's Forest, it was very quiet in the entire campground with probably no more than about 20 camping families in the entire campground. Unfortunately, our solitude was shortlived. The following morning (Monday) we were jarred awake at 7:00 in the morning by the Rim of the World High School football team going through their morning drills. ONE, TWO, THREE, HUT!! was enough to wake the dead and yet the kids slept through at least an hour of it. I must have tired them out with all that hiking from the day before. Being an early riser, it didn't bother me, but it was a little unsettling to hear civilization that close to semi-wilderness. Another example of people encroaching upon the wilderness and making it a little less hospitable. All in all, it was a great trip, just a little too short for all of our tastes. The little one thoroughly enjoyed his first camping trip and is looking forward to his next trip which should be during the week of Thanksgiving. Any comments on this page, please sign my guestbook.